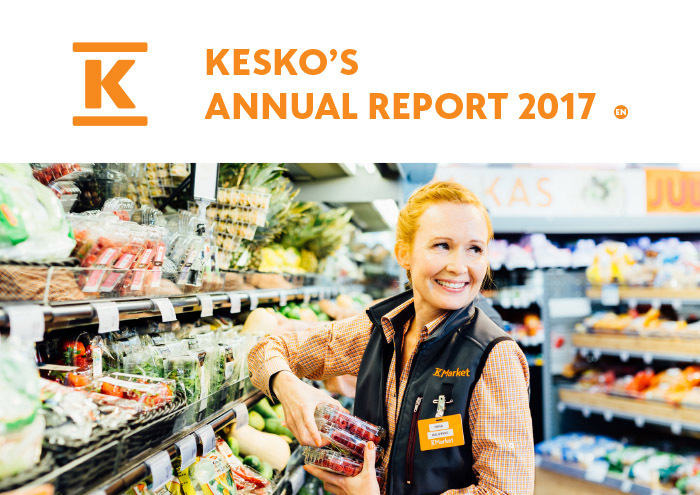 Kesko’s 2017 Annual Report describes the progress made in Kesko’s strategy and sustainability work, providing comprehensive performance indicators. Kesko’s integrated Annual Report contains a strategy section, a sustainability section, as well as the financial statements, the Report by the Board of Directors, and the Corporate Governance Statement and the Remuneration Statement. The review of non-financial information is included in the Report by the Board of Directors. The report is prepared in accordance with the GRI Standards and includes Kesko’s UN Global Compact Communication on Progress. Kesko, a Finnish trading sector pioneer, initiated a strategic transformation in 2015. Good progress has since been made in the core areas of customer orientation, stronger growth and profitability, and increased focus of operations. “In 2017, Kesko continued on a strong growth path, focusing on our three strategic areas: the grocery trade, the building and technical trade, and the car trade. Our good performance confirms that our decision to focus on quality, selections and services has been the right one,” says Mikko Helander, Kesko’s President and CEO. Kesko was the first Finnish company to set Science Based Targets for reducing emissions from its properties, transportation, and supply chains. To achieve these ambitious targets, Kesko will increase the use of renewable energy and improve its energy efficiency. Since the beginning of 2017, Kesko has purchased 100% renewable electricity in Finland. The renewable electricity has a Guarantee of Origin, and in 2017 was produced with Finnish bioenergy. Continuing its human rights assessment, Kesko conducted a review of working conditions in the supply chain of grapes in collaboration with the Trade Union Solidarity Centre of Finland (SASK). In August 2017, Kesko initiated K Fishpaths, a multi-year collaboration with the environmental organisation WWF Finland, to save endangered migratory fish.